Pictured are Carolyn Teves (from left), Nicholas Hammond, Calhoun native Zeke Waters, and Remi Jeffrey-Coker, all a part of the SCAD Rose of Babylon Team for the 28th Walt Disney Imagineering Imaginations Design Competition. Zeke Waters, a 2015 graduate of Sonoraville High School, has attended the Savannah College of Art and Design for the past few years, exploring his passion for design and art. And during his studies, he came across the Walt Disney Imaginations Design Competition multiple times. Throughout his time at SCAD, Waters has had friends who entered in the competition, and his interest was further peaked later on in his undergraduate career when a few fellow students wanted to form a team with him for the 2019 competition. "We entered the project and thought the prompt was exactly what we need because we're all really passionate about making sure we create experiences that actually influence people and the world on a larger scale," Waters said. The Imaginations Design Competition was started in 1991 by Imagineering Executive Marty Sklar with the purpose of seeking out and nurturing the next generation of diverse Imagineers, according to a news release from Walt Disney Imagineering. The competition is open to college students across the country, and offers an opportunity for them to design an experience that could potentially be incorporated in future Disney theme parks. Waters' team was on the list of the six finalists, meaning his entire team would receive an all-expenses paid trip to Walt Disney Imagineering in California where they will present their projects to Imagineering executives in February and compete for awards. The other teams will be coming from Florida, Texas, California and Massachusetts. During the initial stages of their project, Waters and his team — fellow SCAD students Carolyn Teves, Nicholas Hammond and Remi Jeffrey-Coker — decided to choose a focus location through the theme of the hanging gardens of Babylon, which they historically placed in Iraq. "The Rose of Babylon," the title of their project, is a botanical experience for people of all ages and a modern re-imagining of ancient Babylon, and it's meant to inspire a rebuilding of Iraq. This interactive exhibit allows guests to experience ancient Middle East and contribute to the spread of resources and new life, a Disney news release stated. And the team understood that with the current political climate in the Middle East, this project might take on a few more sensitivities than they originally expected. Waters said the team had to make sure they delicately addressed current issues involving and surrounding Iraq. "It was a challenge but we wanted to convey a feeling of neighborhood and community through our experience," Waters said. "We wanted to convey coming together regardless of race, ethnicity, religion or gender so all people could come together to work for a goal that would benefit Iraq and would spread out to the Middle East." Waters said through the group's research, they learned that there is an incredibly vast and diverse group of people living in the Middle East. Part of their project is to move beyond the connotations regarding Iraqis and recognize the beautiful history and values of the region as a whole. The Sonoraville High School graduate also commented that his team worked extremely well together, realizing each other's strengths. Each of the team member's voices was heard throughout the designing process, Waters said, and they were able to utilize one another's talents to create a project with a cohesive vision and one they hope will positively influence others. And though his team ultimately entered the competition to win, Waters said he already feels like a winner, being able to work with such a wonderful team, creating something they're each proud of and using their skills to take part in such a rewarding experience. "We have learned so much in trying to explain how we can actually benefit people throughout the world through entertainment and education," Waters said. "I hope in the future I'm able to create these same types of experiences that encompass an entire scope of work." Waters also touched on some of his experiences in Calhoun that served as inspirations and helped him discover his passions. When he attended Sonoraville High, he was involved in theater, set design and painting classes, which inspired him to pursue art in college. "(Growing up in Calhoun) gave me a large sense of self-motivation and perseverance knowing that I can continue to work on my craft," Waters said. "Theater and art in high school led me into a college career where I continued to find my own place." Waters hopes to work in the scene entertainment industry as a show set designer or production designer after he graduates from SCAD. He wants to create environments or experiences that affect people on multiple levels, and without a doubt believes participating in this competition has helped propel him along that journey. Though still in school, Waters has already begun his career and has worked with Universal Creative, where he designed for the upcoming Universal Beijing theme park, and HBO, where he designed an event for the season two premiere of HBO's Westworld. The final winners of the Imaginations Design Competition will be announced after Feb. 8, following a fourday period when finalists will present their projects and compete in California. The top three placed teams will be awarded cash prizes, and all six teams have the opportunity to meet Disney Imagineers and interview for internships during their visit. Owner Brent Ward of Calhoun's Cheeseburger Bobby's said the restaurant wasn't getting enough business to stay open and he was forced to close their doors on Jan. 13. On Jan. 13, Cheeseburger Bobby's owner Brett Ward took his managers aside and the employees who were present and told them that was their last day of working for the franchise, as it was going out of business. The owner said he requested the managers to contact the remaining employees and let them know about the restaurant's financial situation. Ward also said he personally contacted as many of his workers as he could. The restaurant at 273 E. Ga. 53 still has promotional material on the windows and chairs inside are stacked on tables. But a single piece of white printer paper is taped to the inside of the store, with the notice of the restaurant's status. According to Ward, the decision to close the restaurant is due to financial hardships and lack of steady business. "We weren't producing the sales we needed and couldn't keep up with the financial responsibilities of the store," Ward said. According to a Georgia Department of Labor guide on WARN — the federal Worker Adjustment and Retraining Notification Act — only employers with 100 or more employees are required to notify employees 60 days in advance of a planned closing. Though he did not pay employees their last pay period, Ward said he personally reached out to as many of them as he had contact information for and is going to try to help them out when he becomes more financially stable. "Months when I struggled to pay bills, I made sure to pay my employees and managers first," Ward said. "I was very transparent with my managers and told them the next steps when we closed." Throughout the almost three years that the restaurant was open, Ward was active with the schools and tried to host regular spirit nights for sports teams, he said. Looking back on his activity with both school districts, Ward said he hoped that local partnership would have assisted business more. The closing of the business was not due to the employees, Ward said, adding that he enjoyed his staff team, but the store just didn't make enough revenue to stay open. Due to this closing, Ward said he and his family are in a stressful financial situation. "It was not an easy decision because it's going to ruin me. My life savings was in that place," Ward said. "I'm losing my house, my cars, everything. And while my employees' $250 paycheck is important, I'm also trying to find a house for my family." Ward restated that once he got back up on his feet, he would try to help out his employees and managers in the best way that he could, but currently he is unable to provide them with any assistance. The owner doesn't have a timeline for when he will reach more solid footing financially or when he will try to pay back his employees, but he did say his eventual goal is to jump back into the corporate world when everything balances out. Sonoraville Elementary students Aubri Ensley, front row, from left, Waylon Russell, Landon Holmes, Bailey Podbielski, Kevin Tirador, Lyrik Ivey, back row, from left, Barrett Gibson, Katie Mitchell, Trista Fain, Brysley Gilreath and Breeanna Stansell are pictured with teacher Macie Sparks. Belwood Elementary staff members Burnett, Blalock, Rampy, Smith, Belle, Roberts and Zimerle are dressed up on the 100th day of school. 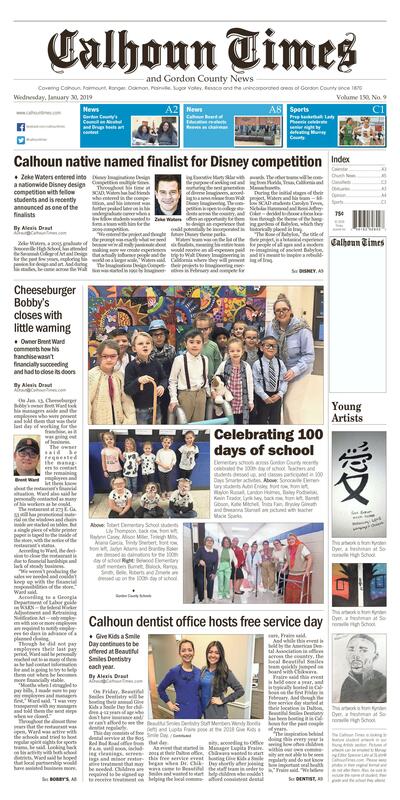 Elementary schools across Gordon County recently celebrated the 100th day of school. Teachers and students dressed up, and classes participated in 100 Days Smarter activities. • Give Kids a Smile Day continues to be offered at Beautiful Smiles Dentistry each year. Beautiful Smiles Dentistry Staff Members Wendy Bonilla (left) and Lupita Fraire pose at the 2018 Give Kids a Smile Day. Dr. Chikwava with Beautiful Smiles Dentistry, located in Dalton and Calhoun, starting hosting a free dental service day in 2014 in order to help children that could not afford dental care in our own community. On Friday, Beautiful Smiles Dentistry will be hosting their annual Give Kids a Smile Day for children 4-12 years of age who don't have insurance and/or can't afford to see the dentist regularly. This day consists of free dental service at the 805 Red Bud Road office from 8 a.m. until noon, including cleanings, screenings and minor restorative treatment that may be needed. Children are required to be signed up to receive treatment on that day. An event that started in 2014 at their Dalton office, this free service event began when Dr. Chikwava came to Beautiful Smiles and wanted to start helping the local community, according to Office Manager Lupita Fraire. Chikwava wanted to start hosting Give Kids a Smile Day shortly after joining the staff team in order to help children who couldn't afford consistent dental care, Fraire said. And while this event is held by the American Dental Association in offices across the country, the local Beautiful Smiles team quickly jumped on board with Chikwava. Fraire said this event is held once a year, and is typically hosted in Calhoun on the first Friday in February. And though the free service day started at their location in Dalton, Beautiful Smiles Dentistry has been hosting it in Calhoun for the past couple of years. that oral health should be prioritized beginning at an early age and we find that this event helps by not only treating children but also educating them on the importance of oral health." Fraire said on behalf of the Beautiful Smiles team that Give Kids a Smile Day is something the entire staff enjoys, preparing for the event and looking forward to see the children who come in every year. She said while the profession of dentistry stereotypically has a bad connotation, many of the children who attend the free dental day leave with smiles on their faces. "We honestly could not do it without the parents that take the time to bring their children by, our awesome dentists and our fun staff," Fraire said. "It's a very fun day that we look forward to every year!" To sign your child up or get more information on Give Kids a Smile Day in Calhoun, call the Beautiful Smiles Dentistry office at 706-625-8888. This artwork is from Kyrsten Dyer, a freshman at Sonoraville High School.